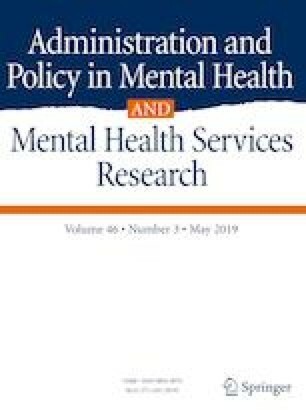 This paper helps to quantify the impact of the Australian National Perinatal Depression Initiative (NPDI) on postnatal inpatient psychiatric hospitalisation. Based on individual hospital admissions data from New South Wales and Western Australia, we found that the NPDI reduced inpatient psychiatric hospital admission by up to 50% [0.9% point reduction (95% CI 0.70–1.22)] in the first postnatal year. The greatest reduction was observed for adjustment disorders. The NPDI appears to be associated with fewer post-birth psychiatric disorders hospital admissions; this suggests earlier detection of psychiatric disorders resulting in early care of women at risk during their perinatal period. Society for Mental Health Research (SMHR) Conference, Brisbane, 2–4 December, 2015; International Marce Society Conference, Melbourne, 26–28 September, 2016. We thank Maxine Croft for her contribution to the design of the study; acquisition, analysis, and interpretation of data for this paper. We also thank Nicole Reilly who contributed substantially to the conception and design of the study and the acquisition of data. Thanks to Natasha Donnelley for her comments on coding of the linked data; Cathie Knox for consumer input; our Associate Investigators Fenglian Xu and Dusan Hadzi-Pavlovic; and research assistants Jolie Hutchinson, Taryn Major, and Sharon Vuckovic. Thanks go to the Western Australia Data Linkage Branch, WA Department of Health; the Centre for Health Record Linkage, NSW Health; and Medicare Australia; Department of Human Services for provision of raw data. We gratefully acknowledge funding from the National Health and Medical Research Council (Partnership Project Grant # 1028554); and funding partner beyondblue: the national depression initiative. St John of God Health Care (Burwood) provided infrastructure support. Cathrine Mihalopoulos was funded on a NHMRC Early Career Fellowship during the conduct of this work (APP1035887). WSL proposed the statistical study design, conducted the analyses and wrote the draft of the paper. CM, MLC, GC, NH, VM, ES and MPA were all involved in the developing the study aims, developing and accessing the main linked dataset and revised the article for content and interpretation. CM and MPA also provided overall study leadership in terms of developing the study context. MLC provided extra assistance with data preparation. All authors have read and approved the final version submitted. The current study was funded by a NHMRC partnership Grant APP1028554: The Australian perinatal mental health reforms: using population data to evaluate their impact on service utilisation and related cost-effectiveness. Beyondblue was the funding partner on this grant. Cathrine Mihalopoulos was funded by a NHMRC Early Career Fellowship Grant (APP1035887) during the conduct of this work. St John of God Health Care gave substantial infrastructure and inkind support. All procedures performed in studies involving human participants were in accordance with the ethical standards of the institutional and/or national research committee and with the 1964 Helsinki declaration and its later amendments or comparable ethical standards. For this type of retrospective study formal consent is not required. The study was approved by the Government of Western Australia Department of Health Ethics Committee (ref:2012/36), NSW Population & Health Services Research Ethics Committee (ref: 2012/04/386), University of NSW (ref: HC12518) and Deakin University (ref: 2012/290) Human Research Ethics Committees. Bauer, A., Parsonage, M., Knapp, M., Iemmi, V., & Adelaja, B. (2014). The costs of perinatal mental health problems. London: London School of Economics and Political Science. Accessed August 21, 2015 from http://www.centreformentalhealth.org.uk/pdfs/Costs_of_perinatal_mh.pdf. Debelle, G. (2009). Some effects of the global financial crisis on Australian financial markets. Accessed August 21, 2015 from http://www.rba.gov.au/speeches/2009/sp-ag-310309.html. Highet, N., & Purtell, C. (2012). The National Perinatal Depression Initiative: A synopsis of progress to date and recommendations for beyond 2013. Melbourne: beyondblue, the national depression and anxiety initiative. Accessed August 21, 2015 from http://cope.org.au/wp-content/uploads/2013/12/Final-Synopsis-Report_PDF.pdf.